IMPORTANT: During the checkout you will be given page for order notes. Please include you engraving details on this page. 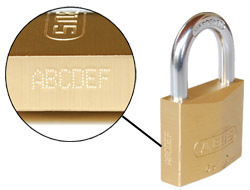 Due to the work involved in engraving locks, the price starts high and decreases substantially after 11 units or more. Please use this page to add engraving to your order. You will need to add to the basket, the number of locks you wish to be engraved. Once you have done these please email us after placing your order with the engraving details. Note that we can engrave only numbers and characters. You can include a slash or hypen as a character if necessary. 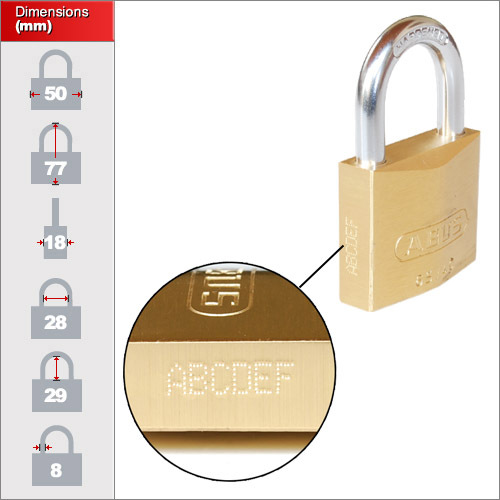 A 30mm lock will take up to 5 characters, a 40mm up to 7 characters and a 50mm up to 9 characters. Note: Please allow at least 5-10 working days for engraved order since our lockshop can become very busy at times.